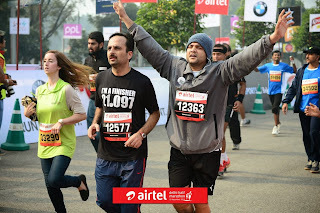 Being a part of rat race through most of my life, it was an overwhelming, humbling and a soul satisfying experience to be a part of a different kind of race - the Airtel Delhi Half Marathon run on 15th Dec 2013 - the race of my life till now. 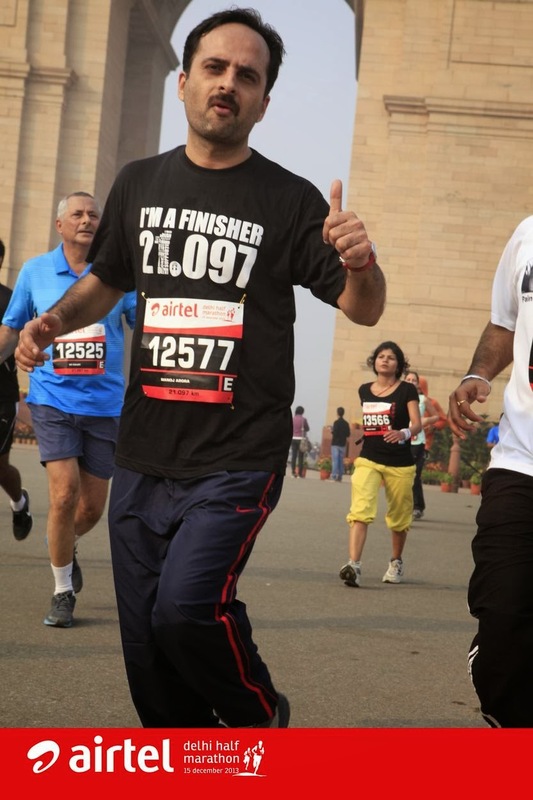 The trigger Around 18 months back, i made an attempt to run 2KM every day, for a week, and failed miserably. A few days later, i met one of my colleagues struggling with a sever back pain, came to know of one of my colleague's close relative dying of heart attack, and saw my body from head to toe.. in the mirror. 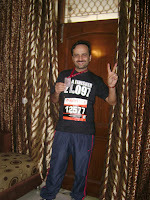 However hard i may have tried to control my breath and justify that i am fit, i was unable to fool myself anymore. Something had to happen. Something unnatural and uncomfortable had to give way to something that is more natural. And was born a desire to get fitter - as God made us. Of course, the ambitions were not too high at that tine. I just wanted to make sure that i continue with my morning walks fairly regularly. From that point 18 months back till date, it has been an awesome journey. 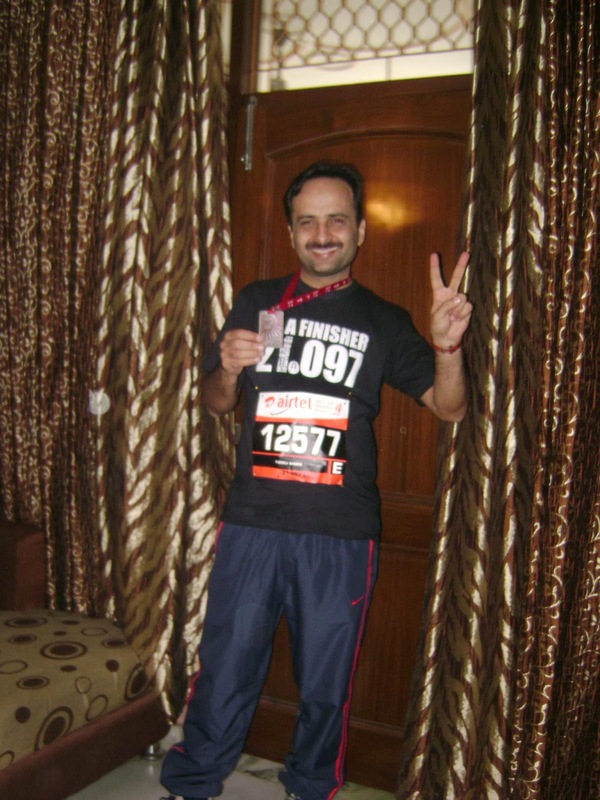 To be able to run 21.097 Km at a stretch and successfully completing a half marathon has given me joy as a bi-product but health and fitness as the main product. Today, I am fitter, faster, slimmer, lighter and more energetic than i ever was in my life. The fact that i am 40+ gets thrown out of the window because age has nothing to do with a burning desire. It has only to do with what you think. I sometimes feel that the age should be counted by the the maturity level of our thinking process rather than days and years - which seems such an unnatural and artificial mechanism created by a jealous mankind. Anything is possible. We only place constraints in our mind, no one else. Age, time, people's opinion, current state, situations, weather, family etc etc has nothing to do with a burning desire in a person's mind. When the dream is big enough, facts do not count. There was a 61 year man running with me. He has been running for 20+ years. He finished just 12 min after me. There are hundreds of such examples in the run. People are looking towards you to show them the way. Anyone (You) can be an inspiration. A fit body can energize your mind and thoughts to an elevated level. Whenever you feel like giving up, look back and see how far you have already reached. This happens many time during the run of the marathon as well as our lives. Taking an expert view always helps. There is no point re-inventing the wheel. Never shy away from asking for help. Once you have taken a decision, don't go back till you finish it. Openly publicize your decision. Even if you try to go back on your decision, your peers, society, friends and relatives will keep reminding you. Practice, Practice, Practice...there is no short cut to success. And when you are practicing something that you are passionate about, you will not feel the pain. There is no right or wrong that has been prescribed by God. Do what you feel is right - applies equally to what we do in our lives. Right and Wrong are only subjective assessments. Live yourself out fully. Do not constraint yourself because of people, situations or anything else. When you are happy, keeping others happy is not difficult. The reward of a goal achieved (medal, certificate, satisfaction etc..), is not the actual reward.The true reward is the new person that we become in the process of achieving the goal. The dream, the desire, the perseverance, the strategy, the execution, the pain, the victory - all these make us a better person - better than what we were, when we started. It is such an amazing experience - with cheering crowds, loud DJ music, men and women of all age running together and inspiring each other, through the best 21km of lush green Delhi. As i recover from cramps this week, looking forward to the next run - not because i want to be ranked anywhere in these run - but because fitness is my right, and i shall not loose it, for anything else in this world. Fitness is one key element that adds happiness to our lives.